Since Hurricane Maria devastated Puerto Rico on September 20, Anita Welych has been aiding rescue and recovery efforts remotely. 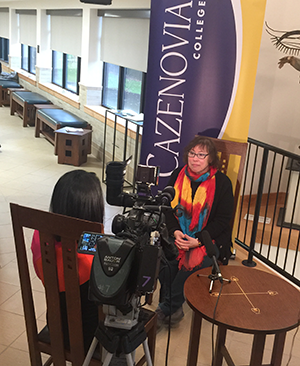 NewsChannel 9 reporter Farah Jadran interviews Cazenovia College art professor Anita Welych about her volunteer work. Welych’s early assignments as a volunteer for Crowd Rescue HQ involved monitoring walkie-talkie conversations that utilized the Zello smartphone app. 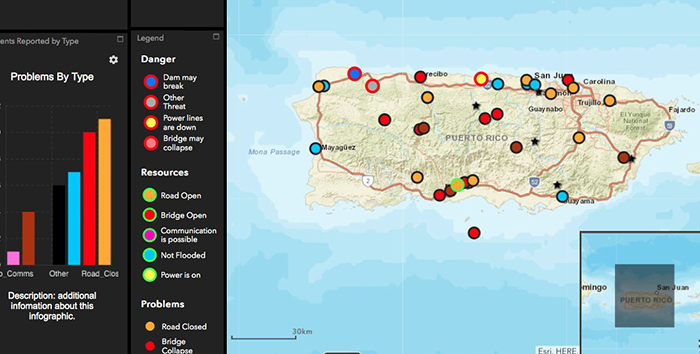 Puerto Rican hurricane victims had begun utilizing Zello channels to communicate the situation in their community, including where bridges washed out, where cell signals were available, and where people could find a safe place to stay. Welych would translate Zello conversations from Spanish to English and provide the information to the mappers with Crowd Rescue HQ. This group of volunteers was developing an interactive map of infrastructure and information to aid rescuers on the ground. Today, this interactive map is viewed 82,000 times a day. Welych explains, “This map became a critical component of the work of many rescue groups, including FEMA. Next, we realized that the citizens in Puerto Rico were cut off from important information.” This realization inspired the volunteer group to develop Spanish language broadcasts for Zello channels. Welych’s volunteer work changed from providing information to Crowd Rescue HQ mappers to being part of the development of twice-daily broadcasts on Zello channels. Welych says that she used the format of the daily updates on the Univision website, a Spanish language news website, as a template to provide information organized by each municipality. ​​​​​​​Welych explains, “I helped to translate the broadcast content into Spanish, and became one of the Spanish language broadcasters. I do this about four times per week.” Welych is now a channel lead with Crowd Rescue HQ. Not only does she translate, prepare and deliver reports, she guides and trains other volunteers in translating and broadcasting information reports on the Zello channels. Now that recovery has begun to slow, the needs of those impacted by the hurricane are changing again. This has prompted Welych to start new tasks, some that utilize her skills as an artist and professor. 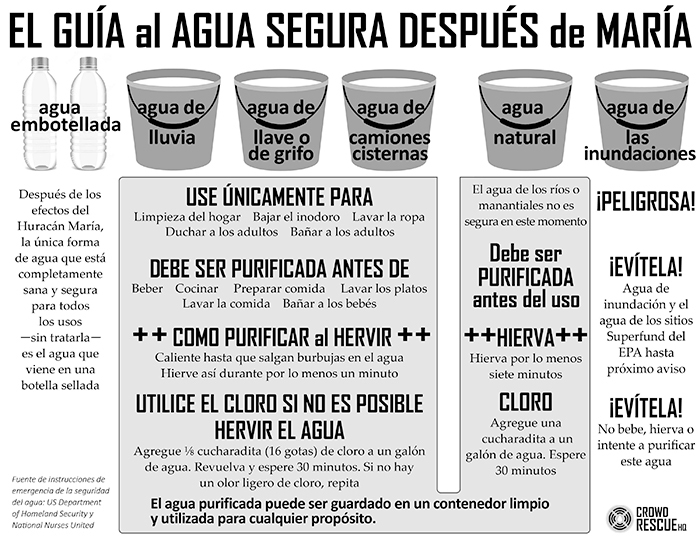 She explains, “We research how to purify water, for instance, or how to prepare an MRE, and create instructions in Spanish and English to broadcast. We have also turned those instructions into infographics. 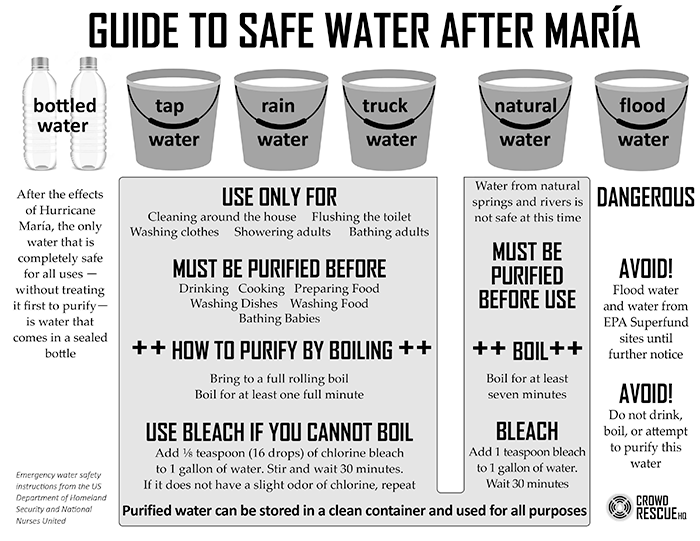 My newest task will be to create some drawings to explain how to distill water.” Her instructions, infographics and illustrations will help to inform and educate those who have inadvertently been drinking contaminated water. “My artistic ability is being called upon to create infographics! I’m kind of excited about that,” Welych says. In combination with her artistic abilities, she is also drawing on her experience and ability to design instruction. As a professor, Welych designs instruction and instructional resources to support students in her art courses. As a crowdsource volunteer, she is designing and providing potentially lifesaving instructional resources for Puerto Rican residents. Fluency in Spanish has allowed Welych to be an effective volunteer. “My mother is Colombian, but since my father was Ukrainian we didn’t speak Spanish at home,” Welych says. She credits taking an opportunity to live in Colombia for nearly six years after college with allowing her to become a fluent Spanish speaker. If you are interested in learning more about how you can volunteer your time with Crowd Rescue HQ, visit crowdrescuehq.org/volunteer_easy_start. Anita Welych received her BFA at Cornell University in Ithaca, NY, where she studied painting and printmaking, with a minor in ecology. She pursued graduate coursework at the Universidad Nacional de Colombia in Bogotá while on a Fulbright Grant. Welych remained in Colombia, her mother's homeland, for almost six years, teaching and exhibiting her art in a variety of venues across the country. While there, she illustrated training workbooks for people developing programs for homeless children in Colombia. Her work is featured in the collections of several embassies there. Welych subsequently returned to Colombia on a Fulbright Teaching/Research Grant, teaching courses at both the Universidad Nacional and Universidad de los Andes in Bogotá. She was a featured speaker at six universities across the country during that stay. Welych completed an MFA in Painting at Syracuse University and began teaching at Cazenovia College shortly thereafter. She has completed several residencies nationally and internationally. She co-founded and directed the alternative Syracuse-based gallery Altered Space in the 1990s, and has served on boards of Open Figure Drawing and ArtRage Gallery. Welych maintains an active exhibition schedule, sometimes collaborating with another Latina artist. Welych works in several media, including book art, printmaking, painting, fabric, drawing and installation. Her lifelong sensitivity to pressing social and environmental issues drives the content of her art. Cazenovia College is an independent, co-educational college near Syracuse, N.Y., offering bachelor degree programs in the liberal arts and professional studies in an exceptional community environment, with academic and co-curricular programs devoted to developing leaders in their fields. Cazenovia, named one of "America's Best Colleges" and a "Best Value" by U.S. News & World Report, was also named a MONEY Best College. For more information, visit www.cazenovia.edu.